I'm sorry to see her go after15 years, but times are tough. This 76 Jaguar XJ12L has 51,800 orginal miles. BRG - tan interior, service manual and sales brochers and service history. All new suspension bushings, shocks, O/H complete brakes,new rad, chevy powered, NO RUST / NO Body Damage, never seen a snow flake. Must sell this weekend asking $3,000.00 PLEASE CALL Mike at 727-465-4906 or E-mail solarforu@hotmail.com I will respond with info and pictures. 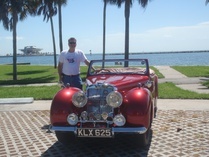 Car is in Largo Fl. chevy power,, would that make it a XJv8L? ?